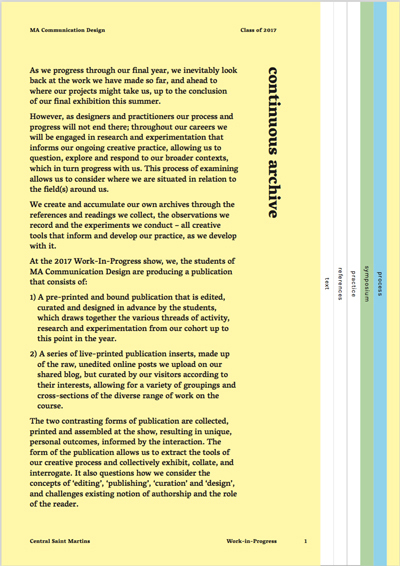 Continuous Archive is a two part publication that exists online and in print, and was published at the MA Communication Design Work-In-Progress show, January 2017. The first part is a catalogue of all of the students work, collected and categorised by type of content; this was curated, edited and printed in advance of the show. The second part of the publication was live-printed at the show after an interaction with the audience; the content was generated from an ongoing blog where students shared raw, unedited posts throughout the year. 210 pages. Publisher: MA Communication Design, Central Saint Martins, University of the Arts London 210 × 297 mm. Wire Bound. Edition of 300.